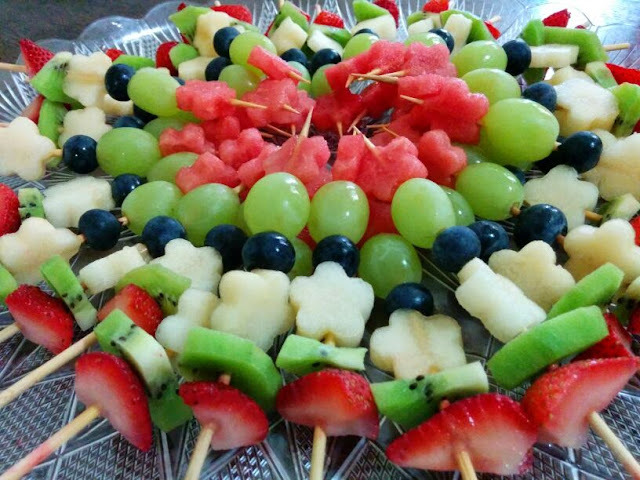 I couldn't stop myself from posting and blogging about these fruit Kabobs. They are so pretty that I now regret not using my camera instead of the mobile to click pictures. I also feel terribly bad about not clicking more pictures. 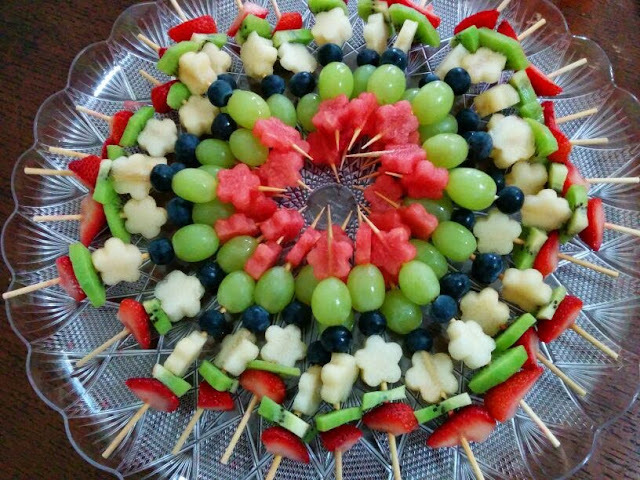 Perfect for serving in Iftar, kid's birthdays, potlucks or parties these fruit snack on a stick is very easy to make but does take a bit of time. It is of course easy to just cut fruits and toss them together in a bowl or serve them on a plate but these beauties are worth that extra time. I took an hour to cut and prepare 40 skewers. I made this platter to send to my daughter's nursery for the end of year party. 2. Cut and peel them as required. Discard seeds and fibre if any. 3. I cut strawberries into quarters and kiwis in wedges, cut as desired. 4. I used a small cookie cutter to cut flower shapes of sliced melon and watermelon. 5. I used whole blueberry and seedless green grapes. 6. Use clean bamboo skewers to skewer the fruits in any order you desire. 7. Serve as is or with any dip or syrup of choice. 1. Refrigerate till ready to serve. 2. Do not use fruits that tend to turn brown after being cut if not serving within few hours. Glad to see ur post after long time!! These r just delicious treat out there!! Glad to see u after so long fruit kabobs look yum. Very fruity,different and definitely a delicious kabobs.